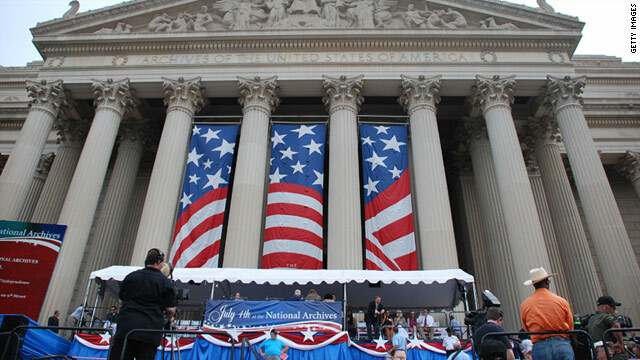 In the nation's capital, revelers celebrated the Fourth at the Mall in Washington. Festivities included a parade and fireworks. President Barack Obama thanked U.S. service members and their families Monday by hosting them on the South Lawn of the White House for a patriotic cookout and fireworks display. "After all that you do for our country every day, we wanted to give you guys a chance to get out of uniform, relax and have some fun," Obama said. Meanwhile, the rest of us settled in for a summer day as, well, American, as apple pie. In several drought-stricken regions, local authorities banned fireworks because of the risk of wildfires. In Mansfield, Texas, residents such as Darnell Cramer had to check in with fire officials before she bought fireworks, according to CNN affiliate KDAF. "We've talked to the fire marshals out here and they've told us to water every couple of hours for the next 24 hours until we set them off," she told KDAF. "We've got two fire hoses on each side. We've got 50 feet and we've already cleared a pile of land out and dug a hole so they're all contained in a small section." Fireworks vendors in some parts of Texas said they were in the red because of a recent ban on the sale of fireworks. "It truly is hard," Dewey Jones told CNN affiliate KHOU. "It’s not just the money. It’s the idea. It’s the idea of government interference just to save a little brown grass along the side of the road," he was quoted as saying. According to KHOU, Jones said the ban means 650 part-time jobs will be gone and he’ll be out more than $1 million in sales; half of which would have been profit. In Utah, fireworks were possibly the cause of a wildfire, said a spokeswoman with the Utah Bureau of Land Management. CNN affiliate KSL reported that authorities Monday were still investigating the cause of the Red Butte blaze that was discovered the day before. It was big this Fourth in Northern California as several Lake Tahoe ski resorts, among them Squaw, Kirkwood and Apline Meadow, dusted off their ski lifts and welcomed skiers and snowboarders to the slopes. Higher-than-normal winter precipitation has allowed snowcaps to retain their fleece, as deep as 15 feet in some areas. "Thanks to Mother Nature we are able to do this," Alpine spokeswoman Rachael Woods told the Sacramento Bee newspaper. "It's such a special, unique way to spend part of your holiday weekend," she was quoted as saying. In St. Louis, Missouri, a Maroon 5 concert and fireworks display were canceled because of rainy weather, according to CNN affiliate KSDK. A recent Marist poll also could give people the blues. It found about a quarter of Americans, mostly young adults, don't know what country the United States declared independence from. But we won't dog them out too much. There's food to be eaten, music to enjoy, a spirited Fourth in the (fire)works. Filed under: Barack Obama • U.S.
We need to gain our independence back from the Israel satan! Brown, whoever you are: You are a discredit to our great nation and a disgrace to humanity. Take your ignorance elsewhere. not that off the mark though a little rough. We have to shake off the stranglehold that the Zionist State of Israel has had on our political leadership ever since Truman reluctantly recognized the unilateral declaration of that state on May 14, 1948. He regretted that decision which was not favored by American political leadership at the time. His memoirs bear testimony. The illegal partioning of Palestine under a British proposition in 1947with 67% of the land going to 33% of Jewish population and 43% to the 67% of non-Jewish population gave rise to this festering conflict. Even before the declaration of the Zionist State, they had started seizing land exceeding even this mandate by driving out 300,000 non-Jews from their land. And this policy has continued ever since. The true followers of Judais ( as against Zionism) the peace loving, morally upstanding Jews have always voiced concern over our lopsided servile policies of subjugation to the Zionist State. Which they think are the cause that this conflict has not been resolved. Jewish Voice for Peace, JStreet, Rabbis of North America for Peace, Gush Shalom and many others have been trying to make the truth known to Americans, but their voices have always been suppressed by our media & Zionist lobby in America. Jerwish public intellectuals & respected academics like Naom Chomsky, Uri Avnery, Ilan pappi, horowitz, Maidhc O'Cathail, George H. Hishmeh and many others. Its indeed time to declare independence from the Zionist State of Israel. We have done enough for them. Hundreds of billions of our tax payers dollars have gone into making them nuclear armed with more warheads than even Britian with latest in American arms , aircraft & equipment. $ 6 billion in just announced aid goes to them every year. Our Middle East policies failed and are in shambles for bowing down to the pressure from them. With the result that our influence, credibility , prestige & clout has diminished in that region which is vital to our geo-political & economic interests. Whole populations once friendly to US have turned hostile. We have allowed other powers like Russia, China , India & Iran to expand their influence in these regions by blindlysiding with the Zionist regime. Time we Americans listen to the voices of peace loving Jews. What a complete waste of time story. I'm thinking this was going to be filled with pictures of people all over the country celebrating, but instead it's some BS about weather, fires, etc. Ugh. What we need to do now is to break the strangledhold that the MIC(military-industrial-complex) has on our government and this country. Otherwise, this country will only fall into further decline. Then again, there's this adadge "ignorance is bliss" but it is the worst enemy facing this country!! !